Robert Reich has a good op-ed piece in The New York Times today, How to End the Great Recession. It’s a clear and convincing account of a major reason this recession resists all the usual remedies. Reich asks how American families could manage to keep spending as if they were keeping pace with overall economic growth, and in turn fuel that growth. There were three reasons: (1) more women joined the paid work force, (2) everyone put in more hours, and (3) families went deep into debt. The last was OK as long as home prices kept rising. But eventually the bubble burst, and there’s no reserve left to rebuild. Now we’re left to deal with the underlying problem that we’ve avoided for decades. Even if nearly everyone was employed, the vast middle class still wouldn’t have enough money to buy what the economy is capable of producing. But if the economy was growing, where did the money go? Mostly to the top. 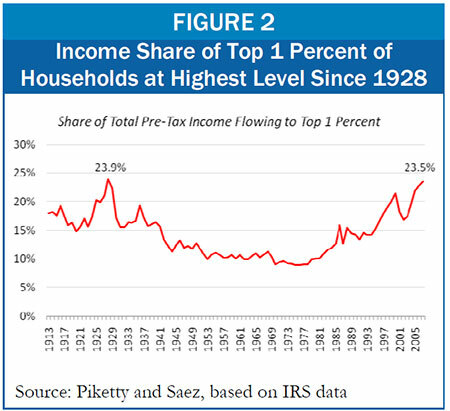 The economists Emmanuel Saez and Thomas Piketty examined tax returns from 1913 to 2008. They discovered an interesting pattern. In the late 1970s, the richest 1 percent of American families took in about 9 percent of the nation’s total income; by 2007, the top 1 percent took in 23.5 percent of total income. Note that the 23.5% figure is the highest since just before the stock market crash of 1929 and the Great Depression. Some right-wing commentators have tried to equate social justice with communism. It is ironic that many in their audience see social justice as the final blow to their own economic survival, when in fact it is the lack of social justice that has put them in difficult straits. In fact, social justice is the only thing that may save capitalism. 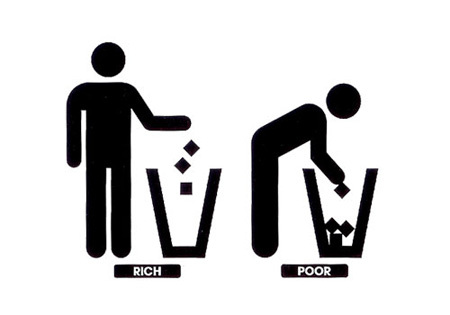 Without it, even the top 1% will suffer, because their wealth can only be drawn from a healthy economy, and a healthy economy requires a more equitable distribution of wealth, through fair taxes (the US system enormously favors the wealthy), fair wages (real wages have been falling, except at the top), and improved social services, such as health care. Stating it more broadly: How long can any political/economic system survive if it remains socially unjust? Domhoff, G. William (2010, August). Wealth, income, and power. Who Rules America? Feller, Avi; & Stone, Chad (2009, September 9). Top 1 percent of Americans reaped two-thirds of income gains in last economic expansion. Washington, DC: Center on Budget and Policy Priorities. Piketty, Thomas; & Saez, Emmanuel (2003, February 1). Income inequality in the United States, 1913-1998. Quarterly Journal of Economics, 118, 1-39. “Free” as in free enterprise? When Clear Channel has a station at the DFW airport saying “FREE Charge and Internet™”, would you think that it offers free charging AND free Internet”? I foolishly did, in part because I thought the ™ applied to “FREE Charge and Internet” and that they hadn’t actually trademarked “Internet”. It’s possible that they meant that you could get free Internet if you were already a home Clear Channel subscriber, but for me, it was $7.95. I know, it’s less than two medium lattes, but that still fails to add to my already incalculable love of flying. Network neutrality means no restrictions by Internet Service Providers and governments on content, sites, platforms, attached equipment, or modes of communication. This includes neither blocking sites nor offering tiered service models. It can be viewed from the perspective of users wanted to access particular content, such as peer-to-peer sites for video or music, or from the perspective of producers seeking to deliver their content more effectively to users. The Internet developed out of public funded services, such as Arpanet, NSFnet, TCI/IP. Eventually centralized routing aspects were removed, allowing the free-wheeling Internet we use today. But in recent years, corporate control over key aspects of the Internet has grown, essentially privatizing a service developed at public expense to serve public needs. Tiered service. Opponents of net neutrality see it as “a solution in search of a problem”, arguing that broadband service providers have no plans to block content or degrade network performance. Yet, Comcast, for example, “intentionally and secretly blocked access to lawful content on the Internet,” e.g., peer-to-peer (P2P) communications, such as BitTorrent. The FCC attempted to block that, but lost that authority after a US Court of Appeals decision on April 6, 2010. Google may soon reach an agreement with Verizon, which will severely compromise the free flow of information that has made the Internet such a powerful force for creativity, collaboration, and learning. Innovation: The Internet has been a striking incubator of new ideas, enterprises, products, services, and jobs. This is to a large extent based on its open practices. Privacy: An Internet with built-in nonneutrality would require an additional level of monitoring, i.e., surveillance, so that packets of information can be routed at the agreed-upon speed and that premiums can be charged. (Cohen, 2010). Free speech: The more service is based on the ability to pay, the less access will ordinary people have to the public forum. ISPs, with a legal responsibility to their shareholders alone, have no incentive to guarantee high quality access to all, and in fact, are legally bound not to do so. They could degrade or block any Web site that was critical of them or did not support their political views. Secrecy: In a Kafkaesque mode, there is no provision for corporations to reveal their selective control of content, including whom they target for preferential or degraded service, why they do so, or even whether or how much they have done. Nearly all major phone and cable companies have promised their shareholders that they plan to block or degrade the content and services of their competitors. Access to information: The other side of free speech. Access suffers when what’s available is based on how much someone paid to put it there. Cohen, Noam (2010, August 15). Internet proposal from Google and Verizon raises fears for privacy. The New York Times. Pacific Telegraph Act of 1860. Central Pacific Railroad Photographic History Museum. US Court of Appeals (2010, April 6). Comcast Corp. v. Federal Communication Commission.. The US government has in effect offered $3.80 for each of the 20 million people who’ve lost family members, food, clean water, homes, and livelihoods because of the floods. It’s spent 158 times that for military aid, much of which has not gone to fight terrorism, but to bolster a military dictatorship, to provide heavy weaponry that threatens India, and to benefit the US defense industry. It’s spent 4,276 times as much to fight a war that shows little prospect of winning hearts and minds, nor for ending terrorism. Then we ask: Why don’t “they” love us and embrace our values? Using 24 indicators, such as a nation’s level of military expenditure, its relations with neighbors, and the respect for human rights, the report quantifies the different aspects of peacefulness. It measures peacefulness within, as well as between, nations. Understanding the texture of peace is more useful than saying simply “at war” or “peace is good.” It helps us see that no country is totally peaceful and that degrees of peacefulness can be quantified for comparison among countries or over time. We can also see how the lack of peace has costs beyond acts of violence per se. [t]he most peaceful societies have higher per capita income, high levels of well-being, more freedom, perform better at sustainability, and appear to have a more equitable distribution of social spending (Institute for Economics & Peace, 2010, p. 4). I doubt that many people who turn to violence as a solution for conflicts, or any military contractors who benefit from the lack of peace, will read this report and suddenly decide that they’re misguided. But for the rest of us, this study provides some tools to question the direction we’re going, a way to measure progress, and a way to demonstrate the consequences of violence to the economy and the quality of life. By the way, last year I celebrated ironically the ascension of the US to #83 on the list. It’s not good for anyone that the most powerful nation on earth is ranked among countries with severe poverty, Balkan states, which are still recovering from major conflict, and former Soviet republics. This year the US has dropped to #85. Institute for Economics & Peace (2010). Peace, wealth and human potential. 2010 discussion paper. Will there at last be a public option for health care? Finally, the Democrats are stepping up to offer a real alternative to the Republican’s do-nothing approach and their own save-the-insurance-companies approach. On March 9, Congressman Alan Grayson, D-Fla., introduced a bill (H.R. 4789 — the Public Option Act, or the Medicare You Can Buy Into Act) which would make it possible for any US citizen or permanent resident to buy into Medicare. The bill would require the Secretary of Health and Human Services to establish enrollment periods, coverage guidelines, and premiums for the program. Because premiums would be equal to cost, the program would pay for itself. “The government spent billions of dollars creating a Medicare network of providers that is only open to one-eighth of the population. That’s like saying, ‘Only people 65 and over can use federal highways.’ It is a waste of a very valuable resource and it is not fair. This idea is simple, it makes sense, and it deserves an up-or-down vote,” Congressman Grayson said. I signed the petition calling for at least a vote on Grayson’s proposal. If you agree, sign it too and to urge Speaker Pelosi to allow that vote.